In this video we will discuss, hosting wcf service in IIS. This is continuation to Part 28. Please watch Part 28, before proceeding. The configuration for the wcf service goes in web.config file. The ServiceHost directive in .svc file is responsible for creating an instance of ServiceHost when required. There is no need to write code to instantiate and start ServiceHost, as we did with self hosting. Step 1: Right click on HelloService solution in Solution Explorer and select Add - New Web Site. Fill in the details as shown in the image below. Step 2: Delete IService.cs and Service.cs files that are present under App_Code folder. 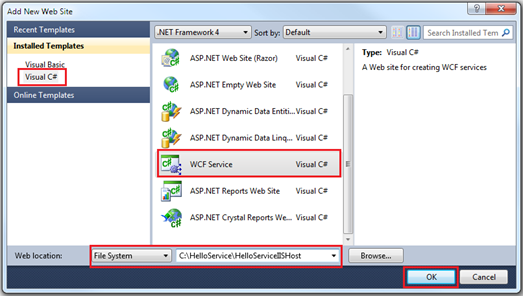 Step 3: Add a reference to HelloService WCF library. To do this, right click on HelloService\HelloServiceIISHost project in Solution Explorer and select "Add Reference" option and add a reference to HelloService project. 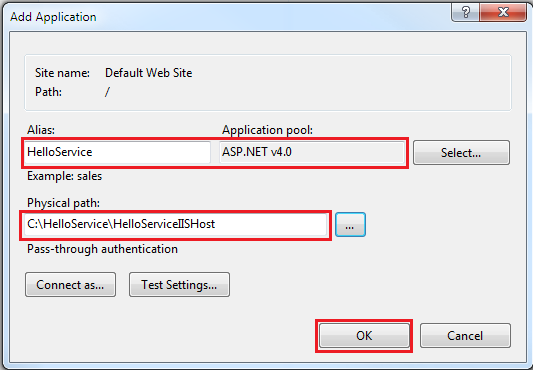 Step 4: Rename Service.svc file to HelloService.svc. Copy and paste the following code in HelloService.svc file. a) Open IIS. In the run window, type INETMGR and press enter key. b) Expand Sites folder. Right click on "Default Web Site" and select "Add Application" option. c) In "Add Application" make sure you have the following settings and click OK. Step 7: Navigate to http://localhost/HelloService/HelloService.svc. On this page you should have link to view the WCF service WSDL. Step 8: Test if the service works as expected using a client application. In our next video, we will discuss the advantages and disadvantages of hosting WCF service in IIS. "The type 'HelloService.HelloService,HelloService', provided as the Service attribute value in the ServiceHost directive, or provided in the configuration element system.serviceModel/serviceHostingEnvironment/serviceActivations could not be found." Exception Details: System.InvalidOperationException: The type 'HelloService.HelloService,HelloService', provided as the Service attribute value in the ServiceHost directive, or provided in the configuration element system.serviceModel/serviceHostingEnvironment/serviceActivations could not be found. When I try to browse the .svc file in iis I am getting the following error. So kindly help me. I want to consume this iis hosted service with remote client... It cannot add service reference like this. how i should add service reference with remote client??? plz help. Thank u. In the svc file we have Service1 implementing Iservice1 interface. As per the steps we have removed those files and added reference to our wcf service. But now while compiling the code written in svc file creates problem as reference to service1.cs has been removed. How to resolve this ?